Along with the Obsidian Surge SF-RW5713, the Sunny SF-RW5730 is one of the new rowing machines released by Sunny Health & Fitness in the second part of 2018. It’s a rower designed for home use, featuring an air resistance system enhanced by a magnetic brake, similar to the BodyCraft VR200. The Sunny Health & Fitness SF-RW5730 rowing machine features a frame that combines steel, aluminum, and ABS parts in its construction. The sliding rail of the seat is made of aluminum material in order to provide a smoother travel for the seat. The front section of the frame that sustains the drive and resistance elements is made of steel, while the covers of the resistance elements and the rear base stabilizer are made of ABS material. The steel parts feature a gray paint finish which is corrosion-resistant. The aluminum rail has its own natural polish. The machine’s frame is approx. 20″ (51 cm) shorter in length than other rowers, such as the Stamina X AMRAP or Diamondback 910R. But nonetheless, it still is approx. 76″ (192 cm) long, and 20″ (51 cm) wide. Plus, it requires at least two feet of clearance on each side and at the rear for safe operation. This being said, it may not fit too well in a small room. But on the other hand, its frame is foldable; the rail can be folded up, and with it in the folded position, the unit’s length is reduced to 31″ (79 cm). The aluminum sliding rail of the machine provides approx. 40″ (~102 cm) of travel for the seat. This being said, the unit should be able to accommodate users up to 6’5″ (196 cm) with no problem. The seat and the rail are also rated for a load capacity of 265 lbs (120 kg). 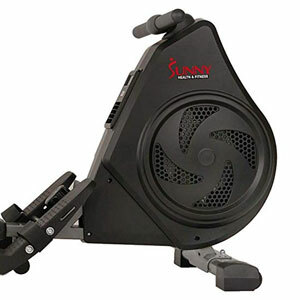 The Sunny SF-RW5730 rower has three base stabilizers. The rear one is made of durable ABS material, similar to the ASUNA 4500. The front stabilizer features a set of wheels to facilitate the unit’s relocation, even though the fully assembled machine weighs only 44 lbs (20 kg). The center, smaller base, only comes in contact with the floor when the rail is folded up. 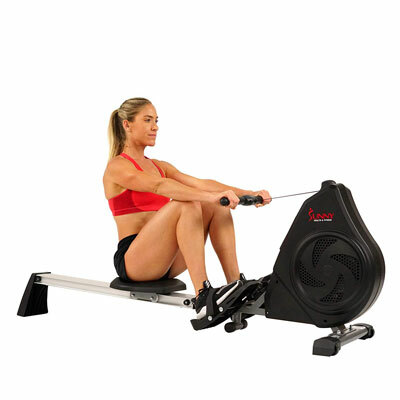 This Sunny Health & Fitness rower is equipped with a fairly large seat, 14″ (35.5 cm) wide, and 11″ (28 cm) long. Its top is made of high-density foam, offering optimal comfort. It is also concave, in order to provide more stability and to prevent you from sliding backward during the leg push. The base of the seat is made of steel and integrates 4 high-grade wheels with heavy-duty metallic ball bearings. They are partially concealed by the metallic side sections of the seat. They provide a very smooth and quiet travel for the seat. The sliding rail of the unit is not completely horizontal. It’s slightly inclined forward. This being said, the machine offers a slightly better workout for the legs during the leg push portion of the rowing motion. Also, in case you’re wondering, the top of the seat is at approx. 12″ (30 cm) above floor level when extended all the way to the back, and about two inches lower when all the way to the front part of the rail. The machine’s pedals are made of nylon material. They are non-adjustable when it comes to length, but they are large enough to accommodate athletic shoes of all sizes. They also have a non-slip surface, rear guards and adjustable straps in order to perfectly secure your feet on them during rowing. Also, they attach to the frame via two steel rods, so they do not pivot like the footrests of other machines, such as the Sunny SF-RW5801. They’re set at an angle of approx. 45°. Last but not least, the unit’s pulling handle is a simple, straight bar with rubberized grips. It is attached to a heavy-duty nylon strap which is highly resistant to abrasion. It does not integrate any pulse sensors or any other types of controls. 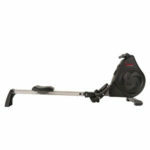 The Sunny Health & Fitness SF-RW5730 rowing machine features an air & magnetic resistance system. To begin with, it integrates a large fan which is designed to provide a dynamic response during rowing. In other words, it responds to your own strength, generating a resistance proportional to the amount of strength you put behind each stroke. Therefore, the whole experience resembles the rowing of a real boat through the water. 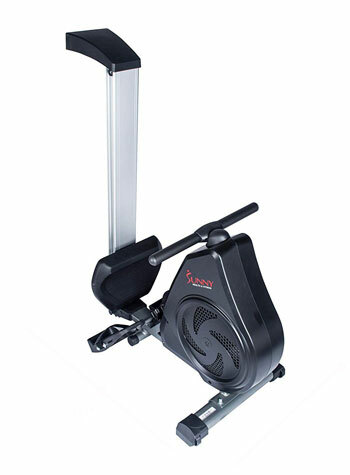 A 3.75 lbs (1.7 kg) metallic flywheel and a small magnetic brake are also integrated into the rower’s resistance system. The magnetic brake requires manual action. It does not involve a servo motor or an electric current. It is attached to the tension knob at the front of the unit through a steel cable. When you turn the knob clockwise, the magnet moves closer to the flywheel increasing the overall resistance output. The magnetic resistance system offers 8 distinct tension levels. The lower one basically uses only the resistance generated by the fan. Conversely, the 8th tension level does add quite a distinguishable extra resistance, for a more intense training. The included fitness meter unit is a basic one. It does not have preset programs, nor it has Bluetooth or other advanced features. It also does not have a pulse reading function. It features a small LCD display which tracks time, stroke count, strokes per minute (RPM), distance traveled, and calories burned. The meter is very easy to use. 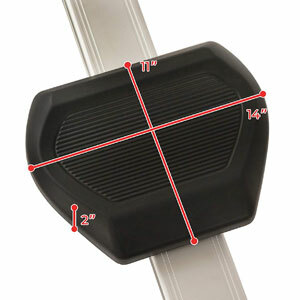 It only has one button which covers two main functions. Its first function allows you to select one of the aforementioned workout metrics to appear on the display, or select the unit’s Scan Mode which rotates all those metrics, keeping each one on the display for a few seconds. The second function is the reset function; by pressing and holding it for a few seconds, you can clear all the values on the meter to zero. The meter unit becomes active when you begin pulling the handle or when you push its button. It also shuts down after 4 minutes of inactivity on the machine. It uses one AAA battery which is included. The front section of the machine which includes the flywheel, the fan, the magnetic brake, and all the other drive elements, comes pre-assembled. However, there still are several parts that require assembly. You will have to attach the front base, the footrests, connect the sliding rail to the front part of the frame, attach the seat, and finally the rear stabilizer. This shouldn’t take more than 30-40 minutes. A fixed wrench and an Allen wrench are all the tools that you will need for assembly and they are both included. Also, the manual provides very clear assembly instructions. Maintenance doesn’t require much. Essentially, you should keep the rail clean to prevent any damage to it or to the seat wheels. A periodic check for loose bolts and parts is necessary. You can also vacuum the fan assembly from the outside, through the perforated sections of its shrouds, in case it accumulates too much dust. The fitness meter does not have backlight. 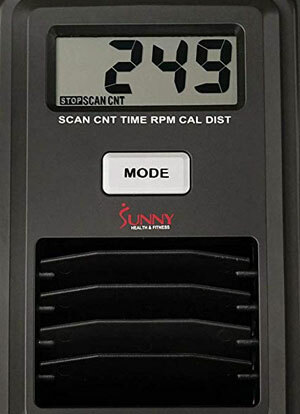 The Sunny Health & Fitness SF-RW5730 is an air & magnetic rower, equipped with a basic console that can track time, distance, count, SPM, and calories. It features a sturdy frame with a fairly long aluminum rail which can also fold up to save space. It’s a trainer made for home use, perfect for a light to intense, full-body cardio training, interval training, stamina development, and weight loss. And finally, it’s an affordable machine, at least 60% cheaper than a commercial model.